Photo: Albert and Edith Adelman House, ca. 1948, 7111 North Barnett Lane, Fox Point, WI. 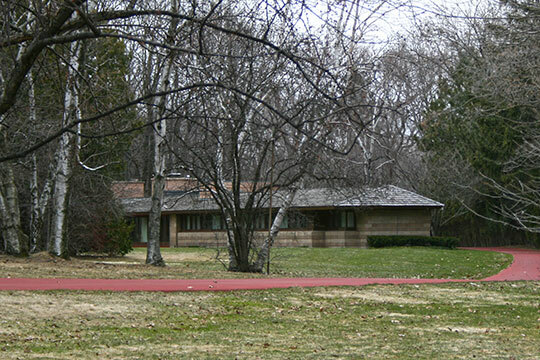 Designed for Albert "Ollie" Adelman by Frank Lloyd Wright. This 5 bedroom, 170-ft long house sits on a 2-1/2 acre lot. Listed on the National Register of Historic Places in 2005. Photographed by User:Freekee (own work), 2009, [cc0-by-1.0 (creativecommons.org/publicdomain/zero/1.0/deed.en], via Wikimedia Commons, accessed August, 2013. Milwaukee County Courthouse is located at 901 North 9th Street, Milwaukee WI 53233; phone: 414-278-4067. Milwaukee County was the name of a political division in 1834, two years before the erection of the Territory of Wisconsin, when what is now Wisconsin was yet a part of the Territory of Michigan. The Michigan Territorial Legislature had passed an act on September 6, 1834 to establish the counties of Brown and Iowa, and to lay off the County of Milwaukee." The seat of justice of Brown County was established at the Village of Green Bay. Milwaukee County remained attached to Brown County for judicial purposes until August 25, 1835, when it was given an independent organization. William George Bruce, editor, History of Milwaukee City and County, Volume I, The S. J. Clarke Publishing Company, Chicago-Milwaukee, 1922.